No matter how much man gets advancement, farming is an activity that was, is and will for all time be undertaken as it is sufficient because it is one of the most significant basic requirements of the population Food. As there is no use of chemical in the organic farming so it is safe for health? These days organic farming is again in trend. Most of farmer likes to do organic farming. There are many countries who promote organic farming. To promote this government also support the farmer in many ways. But Organic farming is not very easy and farmer who prefer to do Organic farming face many problem. Moreover Organic farming is costly than the traditional farming. Some crops are more demanding than others to cultivate organically; On the other hand, nearly all product can be produced organically. Even there are lot of difficulties in organic farmer, till Indian farmer prefer to do it because organic food products are safe for health. In this current age Indian farmer again come to know the value of organic farming. They are trying to do continuation of the age-old farming practices followed by our ancestors. Organic farming has been practiced in India form thousands of years. India is one of country whose farmer likes to use natural method for cropping. They try to avoid artificial fertilizers usages for getting more production of crops. In conventional India, the whole industry of agriculture was practiced using organic method of cropping and they depend upon the fertilizers and pesticides which are obtained from plant and animal products. Organic farming was the back of the Indian financial system. And animal also have major role in cropping. Also the cows are worshiped as sacred animal in the name of God, in India. As far as the data collected by the IFOM, around 80% of the farmers across the globe are from the nation India, so driving those towards the organic form of cultivation will leads to healthy society. Though, the organic method of cultivation in practise in olden days, it was in recent times after the arrival of the chemical fertilizers and other products which forces organic cultivation by show casing the false results of getting high yields. On accounting the harmful effects of using chemical fertilizers and pesticides in the agricultural, the government of India, now focusing towards the healthy society, by creating the awareness about doing organic form of cultivation by launching this scheme. Under this scheme farmers will be given proper instructions along with financial aid to perform the organic cultivation in their respective lands. For this scheme, the government of India allocated over Rs. 400 Crore in order to gain quality foods. Under this scheme farmers will motivate to do organic farming. Farmers are asked to make groups or come together. This help will be given in three parts to the farmer every year. This fund can be making use of for obtaining organic seed, harvest of the crops, marketing of the food and transporting the food to the local markets. By following organic mode of farming, there will be decrease in diseases which are caused because of using improper and harmful chemicals as fertilizers. 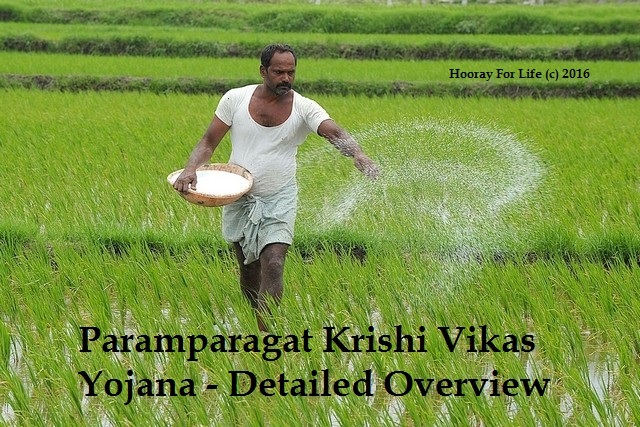 Government Programme implemented under this Paramparagat Krishi Vikas Yojana motivate the farmer to make groups and do the farming in groups so that they can get more output. Under this scheme around 5L acres will be cultivated under organic farming, if the current trail version of this scheme gets succeed. For performing organic cultivation Rs. 20 thousand will be given to the farmers for the time period of 3 years. In current situation, moving towards the natural fertilizers would be the best option in order to avail the better and healthy foods for getting high nutrients. To achieve better healthy life, shifting back to organic farming which practiced olden days would be right option, on accounting the fact government launches this scheme to drive farmers to move towards organic farming. Farmers as well as common people are slowly realizing the importance of organic farming. It produces better quality crops at low expenses. Thus, the central government recently announced that it will put more stress on the implementation of Paramparagat Krishi Vikas Yojana. It is dedicated towards the development of organic farming. Under this project, farmers will see the implementation of two separate schemes. They are National Programme of Organic Production and Mission Organic Value Chain Development that will be concentrating for farmers in North Eastern areas. Farmers will receive technological assistance to attain better yield. The central government will also develop the marketing the strategies of organic crops.